In Italian the word GODO means to enjoy sensual pleasure, so that that the great taste of our chocolate becomes an integral part of enjoying life. 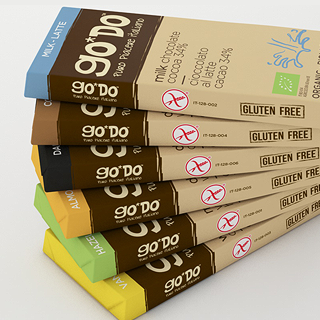 GO*DO chocolate bars are made by a third-generation Italian family in their state-of-the-art factory near the Como Lake. We have total control “from bean to bar “ - farming the cocoa, harvesting the beans, making the chocolate and forming the bars. Our cocoa beans are grown organically in a number of top cocoa producing countries including the Dominican Republic and Peru, areas known for fine cocoa. The result is superb bean quality and a truly sustainable brand.